The bat is meant for playing with light weight tennis ball only. Perfect bat for the modern day batsmen looking to play all round the wicket. Go ahead, pick a best selling cricket bat that has been tested by the world and is trusted by the world. If you want to buy some of the best cricket bats in India, you need to know what material the bat is made from. 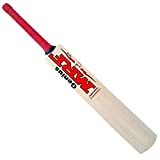 In India most god bat are either made of English Willow or Kashmir Willow. 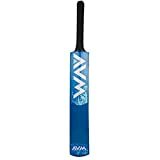 There are many brands of cricket bats in India, and some of the manufacturers also use some reinforcement material in the cricket bat’s handle to give more power and punch in the main hitting zone. This material can be carbon fiber or even titanium. The bow of the bat is very important as a larger bow and thicker edges will give the bat more power. The type of bow is dependent on the player, as to how comfortable he is with different types of bows. A good tip for the best bats is that you should go in for a natural finish, and also check for an anti-scruff cover at the lower willow. The bat’s handle can be long or short,and is again totally dependent on the player, as to what they find the most comfortable. The overall bat size again depends on the batsmen. Taller batsmen will choose bigger bats, and shorter batsmen will chose smaller bats. You need to know what size of bat you play best with. Here are two of the best bats that you can buy in India. They have been carefully selected for their great features and properties. This is a very finely crafted cricket bat made with English Willow. This is an powerful batsman’s bat. English Willow is one of the best materials to make a great cricket bat with. This particular bat has been designed for hard-hitting and solid strokes. The SG Sierra 350 has a traditional design, making it stable and great for hitting hard and fast. The bat design provides optimal stability and great stroke play, for the offensive batsman. It has thick edges and the blade of the bat is curved to give the bat a lot of hitting power. It has a higher sweet spot so that the batsman can hit hard and true. The SG Sierra 350 has a handle that has been reinforced with Sarawak cane. This reinforcement provides the bat more stability and gives it more power and control. The bat also has the all new Chevtec grip that provides even better control. This bat features a short handle, and is lightweight, making it excellent for high performance, comfort and easy stroke play. The bat is ideal of professional and intermediate players, and is a great piece of sporting equipment over all. This is one of the best premium bats available to buy in India. One of the top bats in the SS range, the Gladiator is a fabulous piece of cricket equipment. When it comes to performance few other bats can beat the SS Gladiator. The SS Gladiator is truly a bat worthy of the best cricketers. It has been made with absolute top grade or what is called player’s grade English Willow cleft. This bat is especially good for hitting the big shots and also doing the special nicks and cuts for finesse batting. The sweet spot of this powerful bat is in the low to mid area, which allows a batsman to really use the swing to hit big. It is especially great for using the bat’s momentum to hit hard, powerful and long. Designed for maximum power as well as fine control, the spine of this bat is made in the traditional way. Here are the main features of the Gladiator, a truly impressive cricket bat meant for professional players and serious batsmen. The bat has a beautiful balance and combined with its pickup, it really translates into pure joy drive shots. 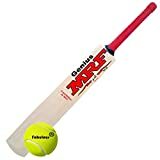 With the bat swing and momentum adding to the advantage of a big hit, the weight of this bat makes foe excellent stroke play in the long on and long off regions. As for drives it is a perfected bat for it, exploding with stored power, and releasing the power as you move into a front foot drive. Since the overall balance of the Gladiotor is very good, using it in the back foot is also great. Its lightweight pickup allows a batsman to hit square drives with power and precision. It has a balance and design that allows players to very effectively and with devastating effect on the back foot too. The SS Gladiator is a fabulous bat for the hard hitting batsman and the all rounder. With the SS Gladiator you will be able to hit long hard boundaries as easily as you will be able to place finesse shots like cuts and pulls. This is definitely a bat to go out and play a big match with.